For over 65 years, the nation of China has been secretly working upon implementing a 100-year-long plan to replace the United States as the global superpower of the world. Dating back to 1949, China devised a plan to 'wipe clean' past humiliations and revise the order that was established under Bretton Woods that left the world a US-dominated world following World War II, the world that most of us grew up in. Thanks to China's '100-Year marathon', the world we all grew up in is about to go through a major change. 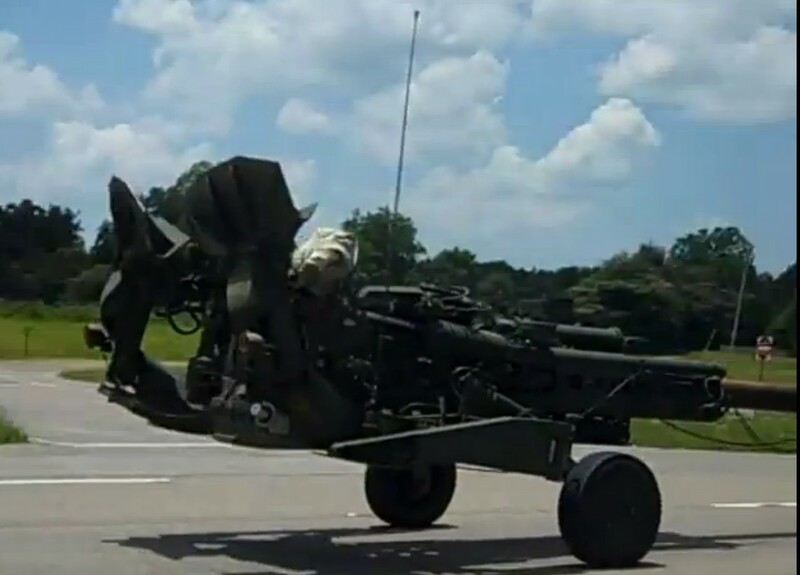 Among the many newly released video reports below of military activity in America, we see a convoy of 155mm Howitzer's (as seen in photos above and 3rd video below) rolling westbound towards Texas on US-98 in Lucedale, Mississippi. 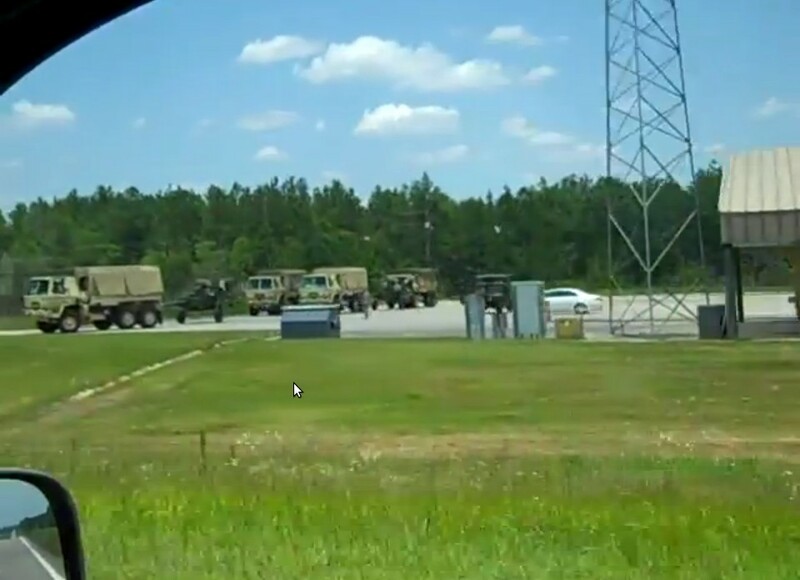 In another video report published by the same videographer, we see another military convoy stopped at a weigh station also westbound in Mississippi. Coincidentally, or not, the Wal Mart truck that appears to be with the convoy at the same weigh station shown in the picture below (seen in 3rd video) is getting a lot of attention. Many more videos and original photos below include an update on the Brandon, Florida Wal Mart and some strange activity there that adds more unanswered questions to this rapidly growing mystery. All of what we're watching across America is the beginning of this 'brave new world' . Back on March 26th, 2015 we wrote a story on ANP called "Months Away From An Event That Will Change America Forever" in which we pointed out the reasons why we believed that China was preparing to take over the world's economic leadership as the US dollar is finally replaced by the Chinese yuan as the world's reserve currency. We learned via story after story that possibly by September of 2015, China (one of the world's largest producer of Jade) would suddenly be in the position to do as Col. Liu Mingfu has said needed to happen, 'to save itself and to save the world', China was needed at the helm. We learn from the Times story that China has had a 100-year plan to replace the US as leader of the world's economy; they've called their 100-year plan “The Hundred Year Marathon.” Col. Liu was recently invited to speak at the Georgetown home of longtime Pentagon consultant Michael Pillsbury and he promoted the English-language version of his book "The China Dream", a 2010 book which called for China to replace the US as the 'global hegemon'. The communist leaders in China fully embraced the book and it has said to become the 'main thought' of President Xi Jinping. Are we witnessing the culmination of China's 100-year marathon in 2015, decades early? Why would a Pentagon consultant embrace such a stand of America being replaced by China as the most supreme power of the world by inviting the Chinese Col. to speak at his home? What does all of this mean for the rest of us? In his book, Colonel Liu urged China to quickly build up their military power so that it could swiftly replace the US as the global power of the world. Col. Liu China to build up its military power to replace the United States as the world’s global power. Many of the events that we are now watching both across America and the world lead us to believe that the final transition, after embarking upon their 100-year 'marathon', is quite likely right now being put into place. In the outstanding 10+ minute video below from Rand Paul Revolution we hear an astonishing claim; will Chinese troops soon invade America under Barack Obama's declaration of martial law, likely to be brought before or soon after the final transition to a Chinese reserve currency yuan and the drop of the US dollar? All across the country we are witness to the events that lead us to believe that the US government and military are now preparing for such an event. This video shows why we're on the precipice with Jim Rogers warning: "Whether we like it or not...the 19th century was the century of the UK...the 20th century was the century of the US...the 21st century of China." For those who somehow feel that China ISN'T buying up America, this video will prove to you otherwise. For those of you who think that US forces will NEVER shoot at American citizens, this video proves that they won't have to. 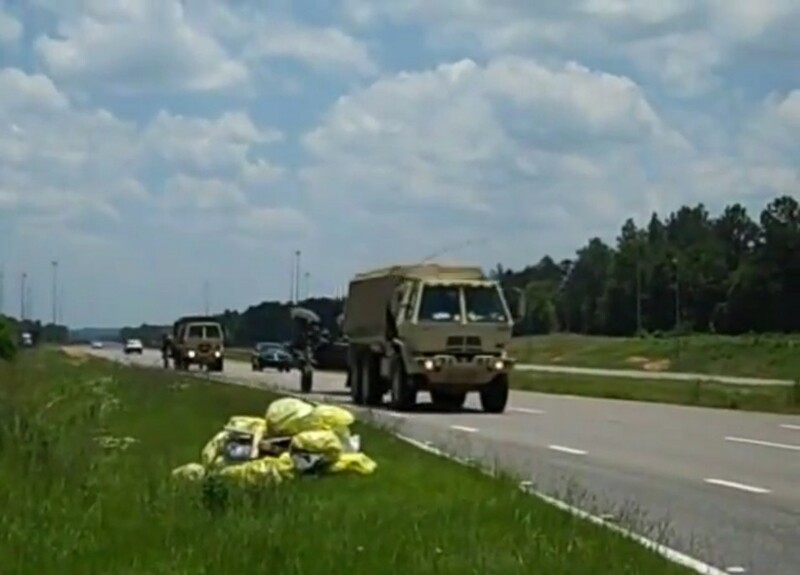 The next few videos show military convoys across America from the last couple days alone. The convoys aren't ending folks; in fact, this seems to be just the beginning of them. China is preparing to take the helm. Changes have to be made to make the final transition to this country that they invision. Military in American streets is part of their plan. Many more pictures also below that have been sent in to ANP by our readers including more mysterious happenings at the closed Brandon, Florida Wal Mart. 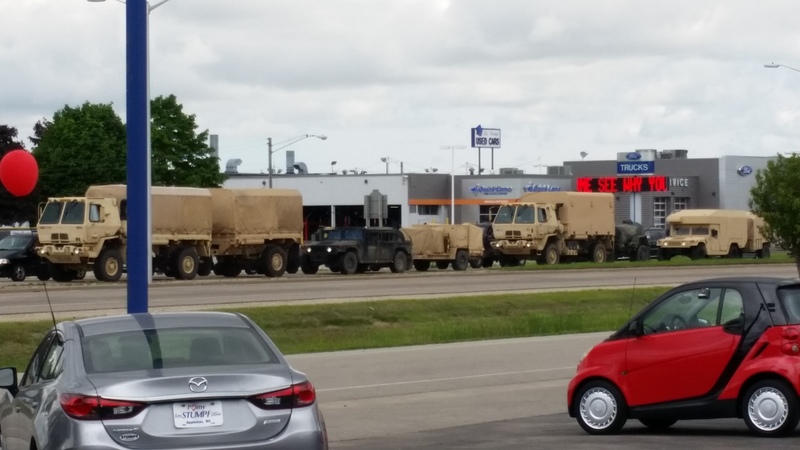 In Lucinda, Mississippi, a military convoy was seen off of the side of a highway at a weigh station; a Wal Mart truck was also seen in the same location. More proof of Wal Mart involvement with Jade Helm or just a coincidence? It does appear as if the truck is moving into the weigh station and not sitting idle as the rest of the military convoy trucks are idle. Thoughts? 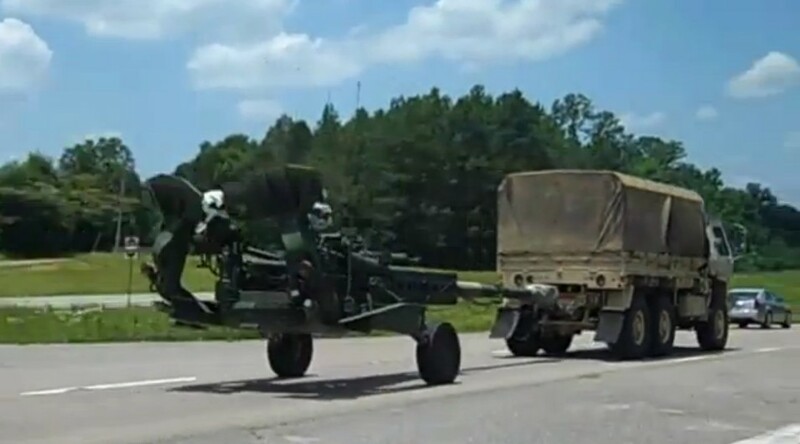 The 2nd video shows what our videographer calls rolling 155mm Howitzers and they're heading west bound on US98 in the direction of Texas. Is this more Jade Helm activity? Did all the publicity on JH force them to 'jump the gun'? Dahboo7 tells us more about the massive build up across America that INCLUDES FEMA and UN vehicles. The next video shows a series of Apache helicopters over Snyder, Texas from ANP reader Stacy White. The pictures below were sent to ANP by a reader in Brandon, Florida and show some strange activity happening at the closed Wal Mart there. First thing that we noticed was the 'for lease' sign on the property. Wal Mart officially stated they would be reopening it within 6 months or so; have they changed their minds? They are also putting up additional fencing and adding the black material to prevent people from seeing in. If all they were doing was plumbing work, why would they need that kind of privacy? If all they are doing is plumbing work, do they need to tear up the entire parking lot? This was taken in Appleton, Wisconsin. This next set of photos show more of the Mississippi howitzer and convoy. The following photo was sent to us of a military convoy in Colorado containing earth moving equipment. Were these headed towards Pinon Canyon to help with 'fence installation' and 'Raider Focus'?